Level I, II, III are considered beginner levels of Agility. 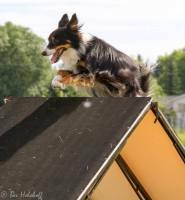 Beginner agility is for those people interested in teaching their dog the basic agility equipment and skills. Agility Equipment performance and skills will be taught using positive reinforcement methods. Please call if you are interested in agility as limited space is available, dogs who have taken foundation agility will be given priority. Handling Skills is for those people that have completed at least the Beginner Agility Levels I, II, III. Teams will build their handling skills. Skills include directionsal commands, change of sides, obstical performance, discrimination and course skills. Dogs should be confortable on all piece of equipment. Each class is designed round the skills of the dogs and handlers in the session. Email or call for info. 4 Paws Training is actively persuing the addition of other dog sports, such as Lure Course, Barn Hunt, Scent Hurdling, and Tracking. If you are interested in any dog sport give us a call! 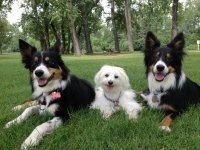 McMurrays' Active Canines practice on Sundays from 7:00-9:30pm. These sessions are for dogs that are in the pre-trial stage or who are currently competing in agility. The sessions focus on continuing to build the skills to run full courses at all levels of competition. Dogs are required to have the skills to safely complete all pieces of equipment. This session focuses on building a strong foundation in the skills for agility and creating a relationship between the dog and handler. 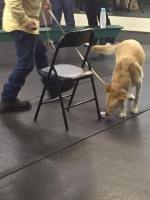 The session builds confidence in the dogs ability to work with the handler. Foundation Agility students will get first choice to enter into beginner agility classes. Dogs should have basic manners to attend. Sessions are once per week for 5 weeks. Drawing the path is a key component to success in the agility ring. This session is a continuation of the foundation class that will focus on sequencing ground obstacles and the partnership between you and your dog. Skills include turns, directional cues, gate training, and ground work. Students will receive valuable information on training agility at home. This is a great course to have prior to starting level 1 agility. Maximum number of dogs is 4. Once per week for 5 weeks.